Huggies wipes just $.50 each! Walgreens has a GREAT deal on Huggies wipes this week! You can get a package of Huggies wipes for just $.50! 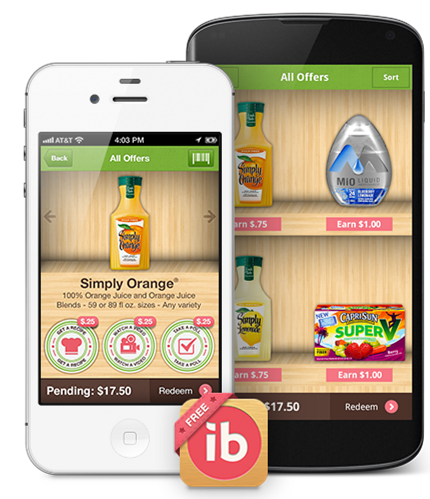 Final Price = $.50 after coupon and cash back from Ibotta! Kids Eat FREE at Chili’s! If you don’t feel like cooking tonight (I’m right there with you), here’s a PERFECT excuse to eat out! Kids Eat FREE at Chili’s! If you don’t have kids, you can also take advantage of a FREE appetizer coupon or a FREE dessert coupon! The coupons are valid through 7/17, so if you’ve already got dinner planned tonight, it gives you a reason to eat out another night this week! PLUS, you can get CASH BACK with your Ibotta app! You’ll get a $2 bonus just for signing up (after you redeem your first rebate), and you can earn cash back at Chili’s, your local grocery stores, and even movie theaters! I’ve already earned $75 from cash back offers this year! NOTE: This post may contain affiliate links and I may be compensated if you may a purchase using links in this post. Please refer to my disclosure policy for additional information. IHOP Pancakes for $.56 today only! 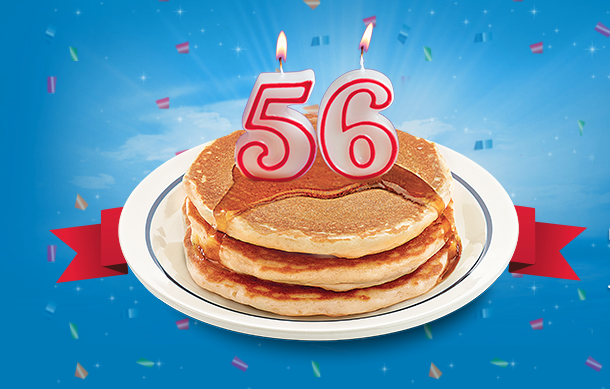 If you love IHOP, today they are celebrating their 56th anniversary and you can get a short stack of original buttermilk pancakes for just $.56! YUMMY! I always recommend calling your local store before you go to make sure they are participating. Limit of one short stack per customer. This offer is valid today, 7/8, only from 7 am through 7 pm. No coupons needed! 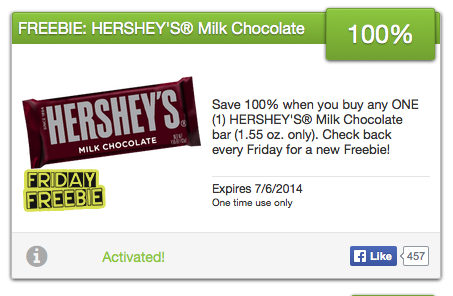 While you’re out shopping today, treat yourself to a FREE Hershey’s chocolate bar! I love chocolate and definitely can’t pass it up when it’s free! Use your customer loyalty card that is registered to your account at check-out, and you will receive a rebate on your SavingStar account for the cost of your chocolate bar! If you’re not familiar with SavingStar, you can earn cash back on your grocery purchases in the form of Paypal cash or Amazon gift cards! It’s so easy! NOTE: This post contains affiliate links and I may be compensated if you use the links in this post. Please refer to my disclosure policy for more information. Get cash back for buying milk and eggs! Have you signed up with Ibotta? You can get CASH BACK for buying milk and eggs! I have been using this app for a year now and I’ve earned $143 cash back for buying groceries and other household items! You can even earn cash back when you go to the movies or visit local restaurants! Redeem your first offer within 10 days and you’ll get a $2 bonus just for signing up! Submit your receipt and get your cash back! Right now, they have a $.50 cash back offer for milk and for eggs! Plus, when you redeem the milk offer and 2 other offers, you’ll get an additional $.50 bonus! This means you can earn $3.50 just for buying milk and eggs! You CAN use coupons when you purchase these items and you’ll still get cash back. Yay for double dipping!